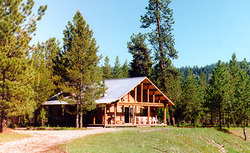 The Alta Ranch is tucked away in the beautiful Bitterroot Mountains 90 miles south of Missoula and 30 miles southwest of Darby. With just 3 vacation homes (authentic log cabins) on 140 acres, the Alta Ranch offers plenty of privacy and room to roam. The 3 log vacation homes, nestled in the pines, are attractively furnished in lodge decor and feature a wood stove in the living room and a fully equipped kitchen and gas barbecue grill. The largest can sleep 7. The upper West Fork of the Bitterroot River flowing through the ranch is an excellent trout stream, ideal for walk-and-wade fly fishing. Other things to do on the ranch include canoeing, gold panning, campfires, hiking, wildlife viewing, or just plain relaxing. Horseback trail rides, float trips, and natural hot springs are nearby. Directions: Alta Ranch is a scenic 2-hour drive from the international airport in Missoula, a 5-hour drive from Spokane, a 9-hour drive from Seattle, and a 9-hour drive from Salt Lake City. Driving south on Highway 93, turn right on the West Fork Road (Highway 473) about three miles south of Darby. Follow the signs to Painted Rocks Lake. Continue on the West Fork Road around the lake on the east side. Approximately two miles past the lake, turn right at the Alta Ranch sign.